If you are looking for La Cruz de Huanacaxtle real estate look no further. We at Bienvenidos Real Estate will be glad to show you all of the La Cruz real estate offerings available including La Cruz villas for sale , La Cruz house and homes for sale and La Cruz condo's for sale. La Cruz De Huanacaxtle or simply La Cruz is located about 20 minutes from Puerto Vallarta or 7 kilometers (4 miles) from Bucerias on the road to Punta Mita. It is a quaint fishing village with small interesting shops and some excellent restaurants. There are some wonderful beaches close by with my favourite Playa Destilladeras, that has miles of flat easy walking and a good seafood restaurant. There is a state of the art new marina which was officially opened by the president in March 2010 as well as numerous condos and homes. Don't forget to visit the Tepic Archaeological Museum which houses artifacts from ancient local cultures and walk the local waterfront where you will see a number of exotic marine birds and turtles. Reasonable real estate prices are still available in this laid back paradise. Brisas Vallarta, a planned community will have over 500 residences with condos, homes, lots and a beach club and Barlovento a boutique beachfront condominium has units for sale. Alamar is Real del Mar's newest offering and the views are spectacular. 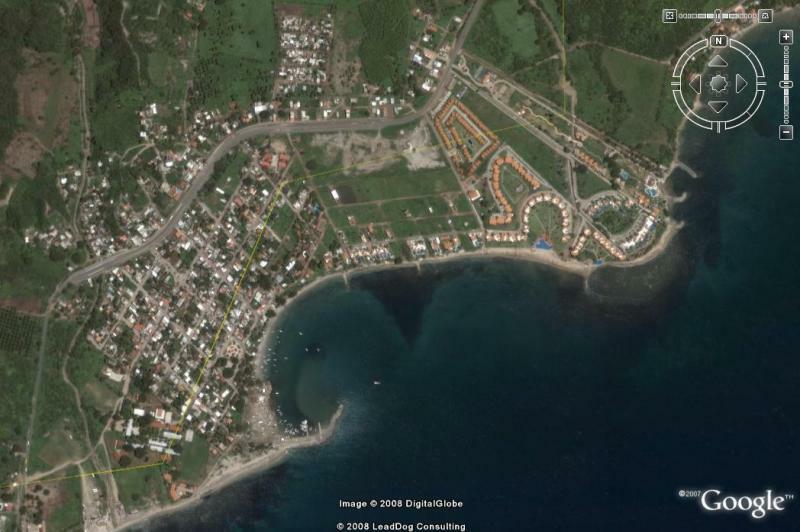 La Cruz de Huanacaxtle ("The Cross of Huanacaxtle") is a fishing village situated on the Bay Of Banderas . It is situated approximately 25 km from Puerto Vallarta. . The town name comes from a cross that is made of Parota wood located at the town's entrance. There is a brand new marina being built as well as numerous other developments including Brisas Vallarta, a planned community of over 500 homes. There are a number of fine restaurants, interesting little shops and a regional museum. The town was founded in the 1930s by the Chavez family.